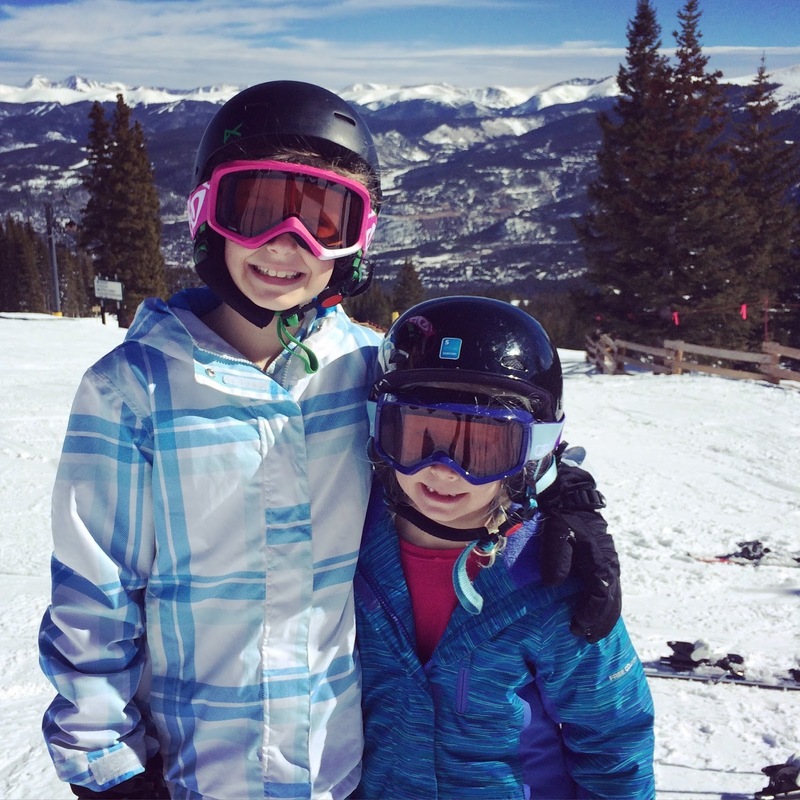 Yesterday I shared about the first part of our ski trip to Breckenridge. (If you missed it, click HERE to read.) Today I'm going to continue with the second part of our trip. 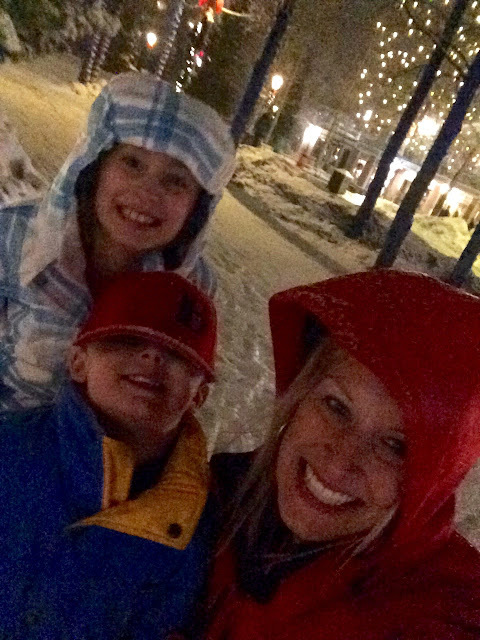 On our third day of skiing we no longer had the kids in ski school so that meant all of us were on our own. 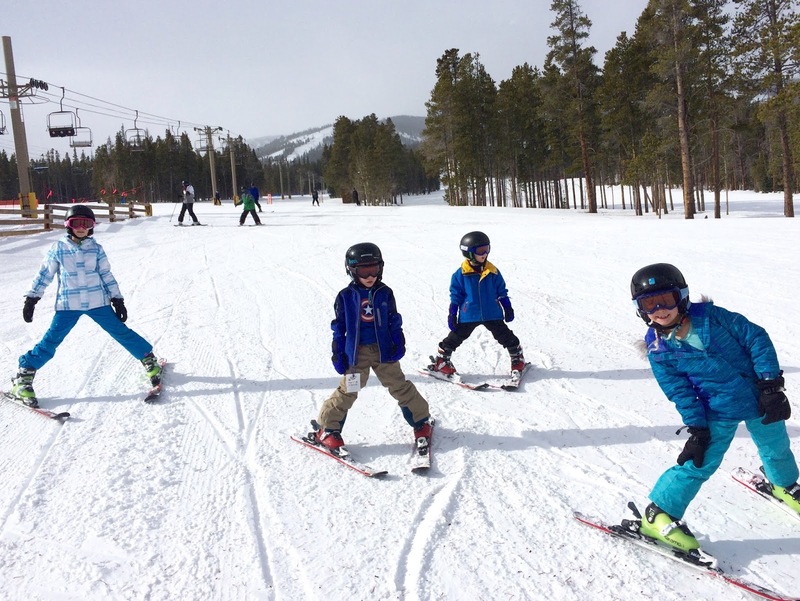 The kids had learned a lot on their first two days and they were doing so well that we didn't think it would be a problem for us all to ski together. Well, let's just say that keeping up with 3 kids on the mountain is a workout, but totally fun. At one point Mr. commented that the money we spent on private lessons was totally worth it. Coach Chris certainly earned his pay! We spent the morning doing the same green runs that they had become accustomed to. It was familiar, it was now easy for them, and it was fun. 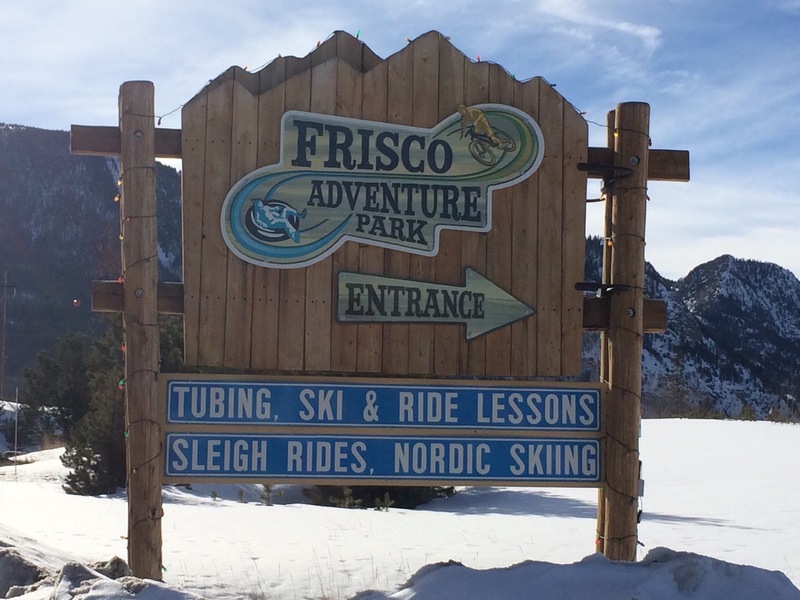 We ventured up a few different lifts that went to some other runs on the mountain and then Mr. decided that it was time to take it up a notch and head to the blues. For anyone not familiar with skiing the runs are categorized as green (easiest - wide, groomed, not steep), blue (intermediate - a little steeper and slightly more challenging), black (advanced - what Mr. prefers) and double black (expert only - also what Mr. prefers). I was hesitant, but the kids were doing so well I figured why not. Being up a little higher on the mountain gave us beautiful views and the girls posed for a quick picture before we started down. This would also be the last smiles any of us would have on our face. I think we had several things working against us on this run. It was almost lunch time so the kids were hungry, complaining, tired from skiing all morning, and just not digging it. I spent more time taking my skis off so I could help one of the kids who had fallen than I did with them on. It.was.bad. By the time we made it down the mountain I was wondering who in the world came up with that brilliant idea. ;-) Needless to say, we headed back to the condo for lunch and decided to take a break from skiing for the rest of the afternoon. Instead of heading back out on the slopes, we made the short drive to Frisco Adventure Park to do a little tubing! 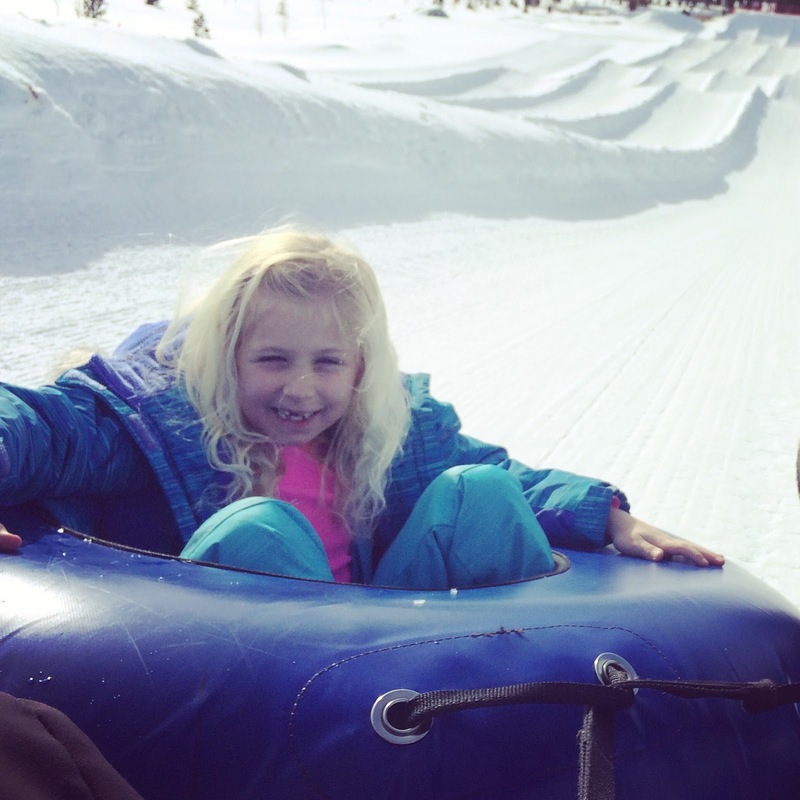 We signed wavers, watched a safety video, grabbed our tubes and got ready for fun. This afternoon was incredibly warm, so a lot of the snow was starting to melt on the hill and turn to slush. The attendants told us this would slow the tubes down a bunch, but we still had fun. They had a magic carpet that took you up the hill. 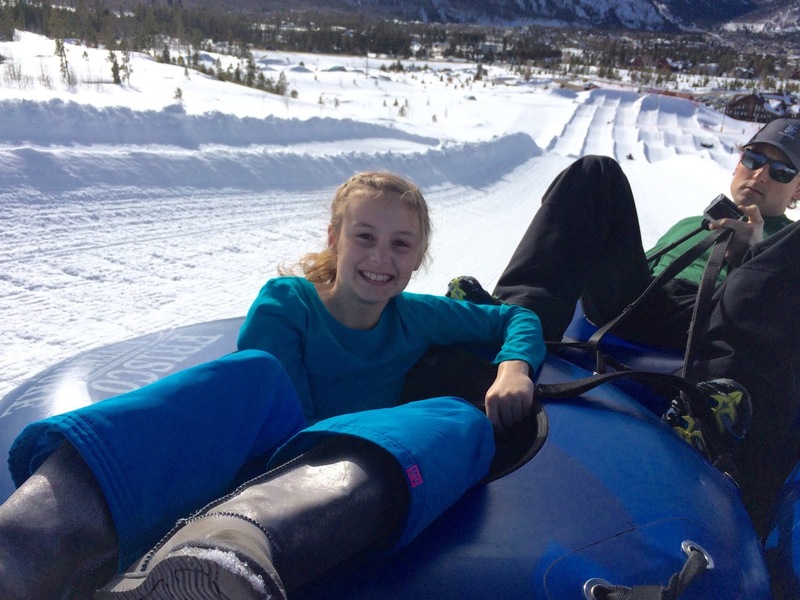 Then there were five lanes to choose from on the tubing hill. You could ride solo, or hold on to other tubes to slide down together. We did this most of the time, because it made us go faster. That evening guys planned a nice night for the adults. They ordered pizza for the kids and got them all settled in and ready for bed. Our neighbor's nanny, who was on the trip with us, stayed with the kids while the adults went out for a nice dinner. Our condo was just a 5 minute walk to the heart of Breckenridge, so it made it easy to get to and from shops and restaurants by foot. 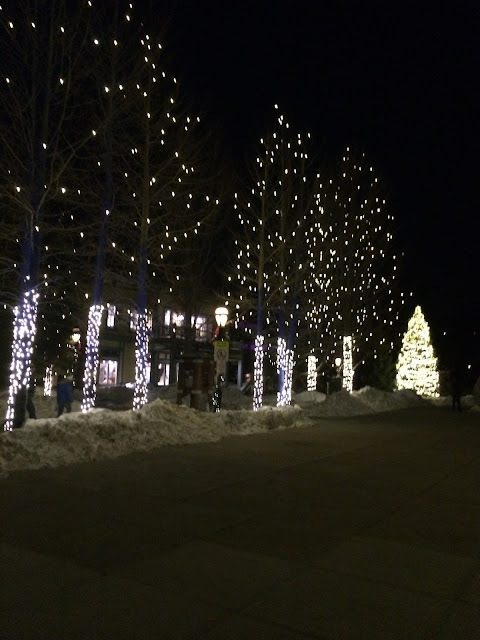 I loved walking around at night because there were Christmas lights in all of the trees lining the streets through town and it looked so pretty with the snow. The next day was our last day skiing and we wanted to make the most of it. We started bright and early and skied all day. One of the most stressful parts of skiing with the kids was getting everyone onto the lifts. 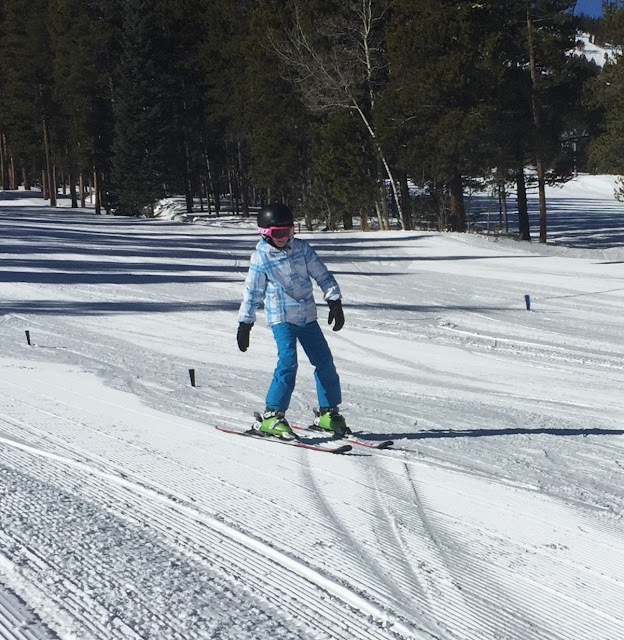 Navigating on skis isn't easy and at the kids did great, but they were slow at times. 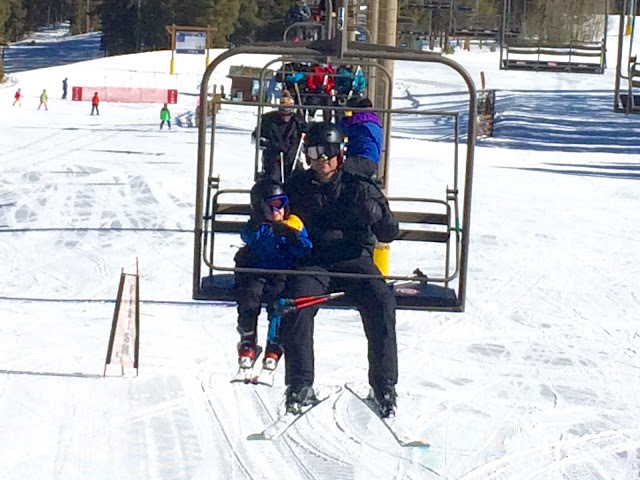 When it was our turn to hop on the lift you have to ski forward to the loading line and wait for the quick moving lift. 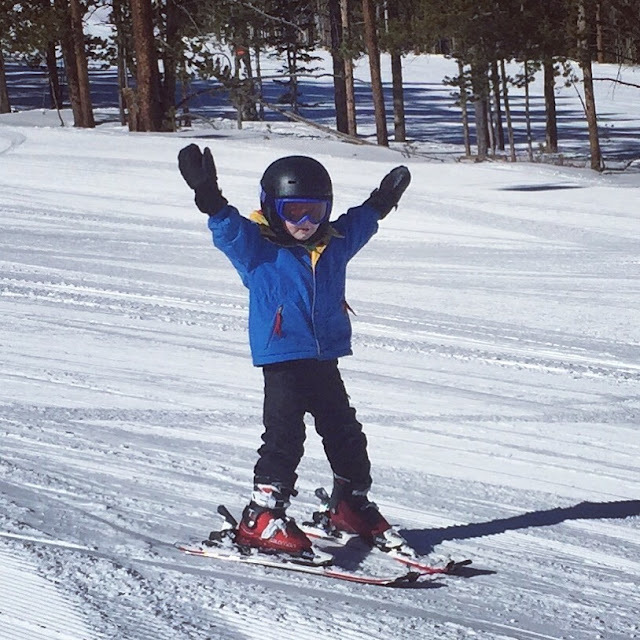 I was always worried one of us wouldn't be up to the line in time, that someone's skis would get tripped and tangled up or that one of the kids wouldn't be able to hop in the seat. Thankfully, the attendants working the lifts were super helpful 99% of the time. They would help grab the kids and give them a boost up and slow down the lift, if needed. After I knew we were all settled and on our way up the mountain I would sigh a big sigh of relief. 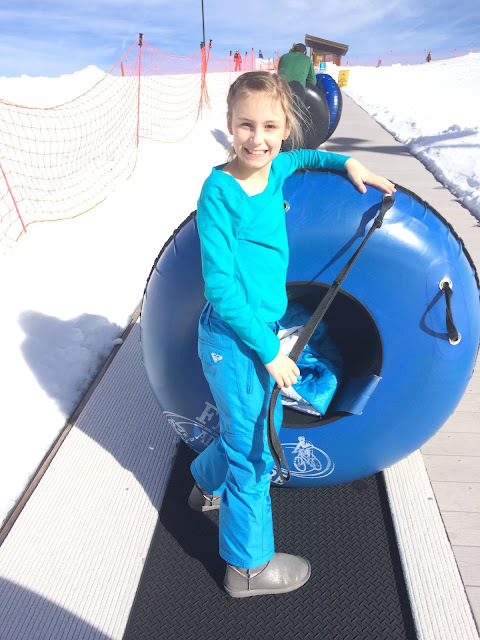 We spent a few runs on the green slope the kids loved and they showed off their skills on the kid's obstacle course. Then we made the decision to head back up the mountain to the blue runs and see if we had better luck this day. It could have been really bad again, but instead if was amazing! They kids did SO well and loved every second. We only had one or two falls, and it was no big deal. 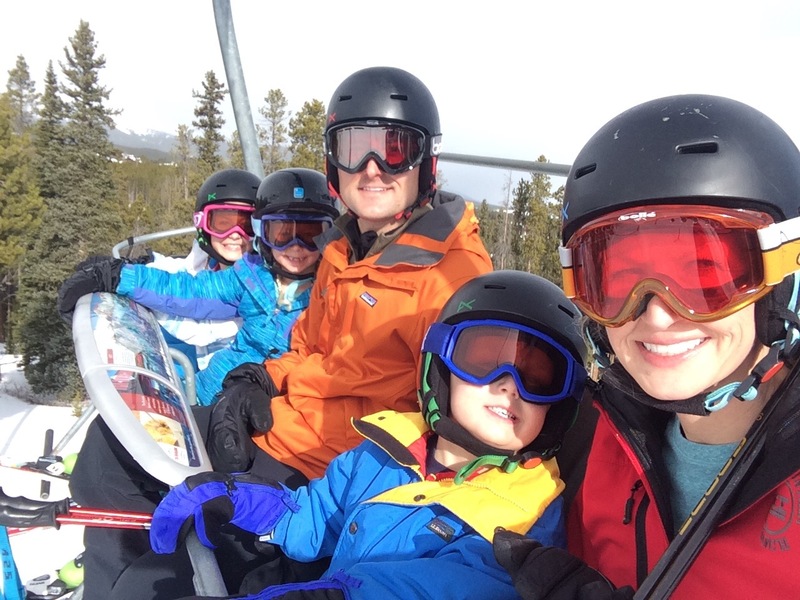 I'm so glad we were successful because it made the rest of the day fun knowing we could go to other parts of the mountain and explore other blue runs with the kids. 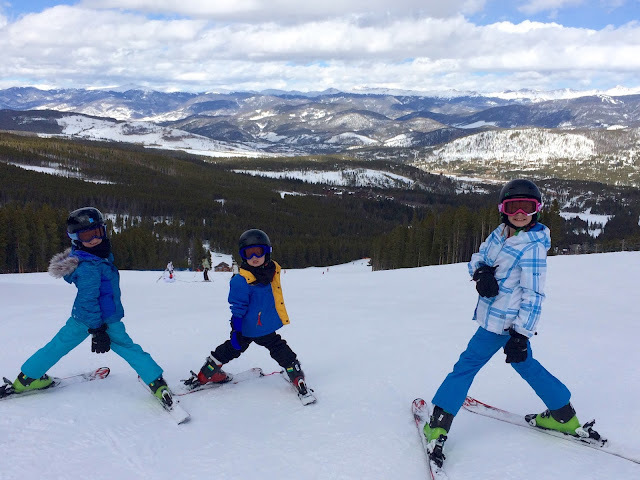 I couldn't believe that on their 4th day of skiing ever that we were all skiing blue runs together. It was SO much fun for me seeing them have SO much fun. This was the most fun I have ever had skiing and I think it's because we were all able to do it together. It will definitely be something that we continue doing each year, for years to come. For our last evening we walked into town and found a pizza place to eat dinner. While we were eating it had started to snow and on the walk back it felt like a blizzard. It was windy, cold and snowy. Our feet were wet and it was hard to see with snow flying into our faces, but it was fun and memorable. So much so that we stopped to snap a picture in front of some of the lights on the way back. 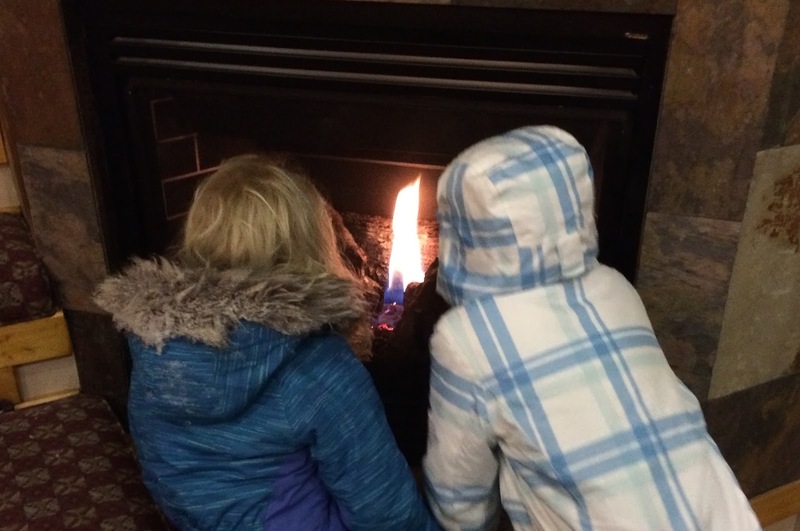 As soon as we got back into the lobby of the condo the kids ran over to the fireplace to try to warm up. When we dragged them away from that, we went to the condo and turned on our fire place. They all sat there with hot chocolate to warm up and soak up the last bit of our night. It was perfect! Our friends left the next morning, but our flight wasn't until the next evening so we had a whole day to sightsee and explore. Be sure to check back tomorrow for picture and details about that day!